Sibika at Kultura is the subject in elementary where young Filipinos learn history and enhance awareness of their cultural and social ability and distinction among other nationalities. In my case, that’s when I first fell in love with batik. According to researches, Batik is a cloth that is traditionally made using a manual wax-resist dyeing technique which is an ancient art form that has said to have existed in Egypt where it was used to wrap mummies and was practiced in China, Japan, India, Nigeria and Senegal. But the Indonesian batik that we know nowadays is especially from Yogyakarta and Surakarta which has notable meanings rooted to the Javanese conceptualization of the universe. I’d like to announce for October 2 to be the Batik Day (haha) but UNESCO already acknowledged the beauty of batik as a Masterpiece of Oral and Intangible Heritage of Humanity on October 2, 2009. So today, it’s an honor to support Batik Day and will not just be blogging about it but will also feel awesome wearing it! The cape batik that I’m wearing in the photos is made by Riana Kusuma of Indonesia which is done in summer colors with beautiful flowers manually drawn in it. But I’m always thrilled to see the different batik designs that talk so much about where they actually come from. Growing up, I associate batik with Indonesians and what I admire about them very much is how batik serves not just as a national costume/ national identity but how they actually enhance and incorporate it in their everyday lives (reason why I always wonder how we can also use Filipiniana daily cause it would be nice to wear your identity, right?). What I also like about Batik is it normally adds sophistication to an outfit. Due to its limited availability in the Philippines, I always find Filipinos who appreciate and wear Batik very sophisticated and smart, surprisingly upon knowing them, they really are (like my elementary teacher who first showed me a batik scarf)! So probably, it’s a good idea to wear it! haha. 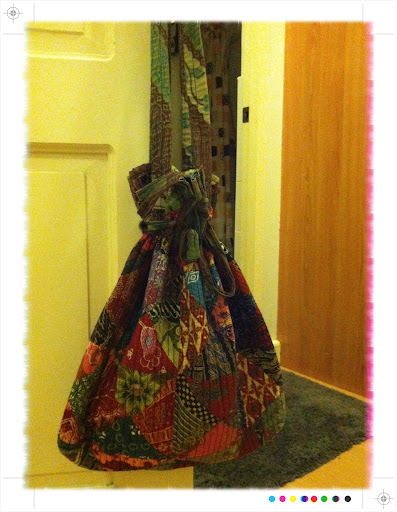 Here’s one of my favorite bags which I got from Jakarta when I sang my heart out upon realizing a dream last year and seeing batik in its country of origin for the first time was an amazing feeling.